The bird only fit for one month of the year is back! December is of course month of the turkey (I’ve tried to buy a turkey at other points in the year and it costs a fortune). I’d been very pleased with brining a whole turkey last year and was all set to do the same again. Just as I filled my enormous container ready to bath, I started flicking through a few online articles just for any interesting ideas. I came across this article comparing brining techniques by the impressive J. Kenji López-Alt. 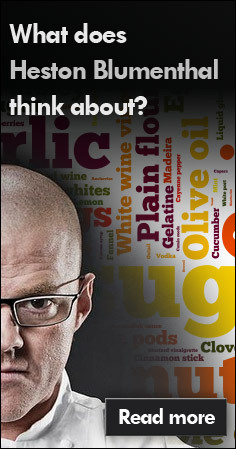 Most surprisingly of all, he advocated so-called “dry-brining” based on some detailed research. 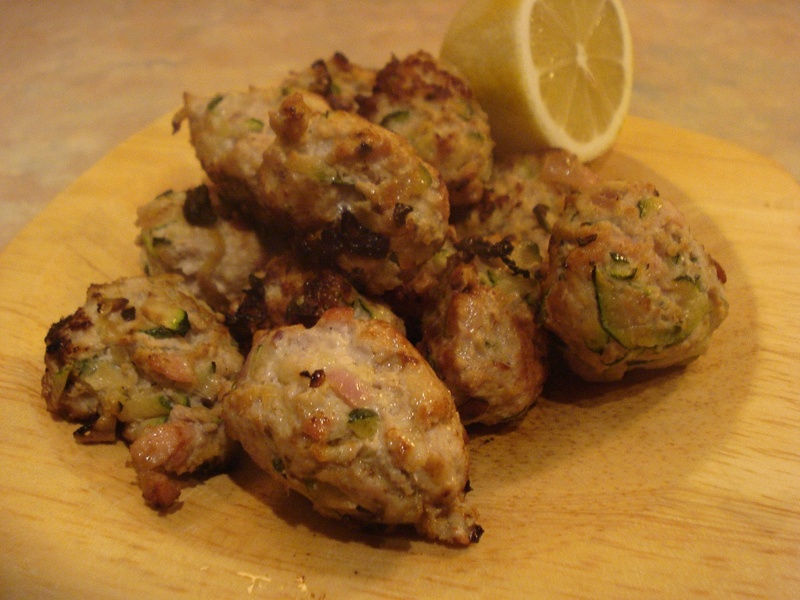 Crucially, you get an easy recipe that promotes succulence and flavour without diluting the turkey taste. And this is certainly what you get. The turkey comes out crisp, tasty and moist and is easily the best way to eat it. Brilliant. I combined it here with some orange flavourings to bring out the best of the meat and add a festive zing. It could easily be adapted with another citrus fruit or left out altogether. I’ve also paired it with Jamie Oliver’s sensational get-ahead gravy with some turbo-charging flavours, which is definitely becoming an annual tradition in my house. Many thanks to Jen at GolinHarris for the turkey and seasonal ingredients. The turkey was an excellent Seldom Seen bird and was truly delicious. The gravy can be made well in advance and frozen until required. To make this, preheat the oven to 180°C. Add the chicken pieces, herbs and vegetables and roast for an hour. Bring on to the hob over a medium heat and add the wine. Scrape away at all the crusty goodness on the bottom of the roasting tray for a minute and then shake over the flour. Stir well for a further couple of minutes, and then add the stock pot and enough boiling water to cover. Bring to the boil and then simmer for another 30 minutes, before straining into a freezer bag. Freeze until needed. For the turkey, untie the turkey and remove all the gubbins you get with it. Dust the turkey generously with salt so there is a fine layer over all of it. Grate the zest of the orange liberally all over too (retain the orange halves). Cover loosely with a tea-towel and put in the fridge overnight to let the salt do its magic. The next day preheat the oven to 180°C. Remove the turkey from the fridge and remove the excess salt – do not rinse it under the tap as you will be losing flavour here. Instead use a damp kitchen towel to wipe off the excess. Cut the orange as necessary and stuff inside the cavity. Grind over plenty of pepper and put in the oven. Meanwhile, in a pan add turkey trimmings, giblets etc and cover with water. Simmer for 45 minutes to make a light turkey stock. After an hour and a half, check the turkey temperature at various points of the bird, looking for it to go over 70°C. Check every half hour until ready, and cover well to rest before carving. While the turkey rests, warm up the gravy. Add resting juices from the turkey, any interesting bits from the resting, and add the turkey stock. Taste and adjust seasoning as required. Carve the turkey and serve with lashings of gravy, and of course plenty of roast potatoes. 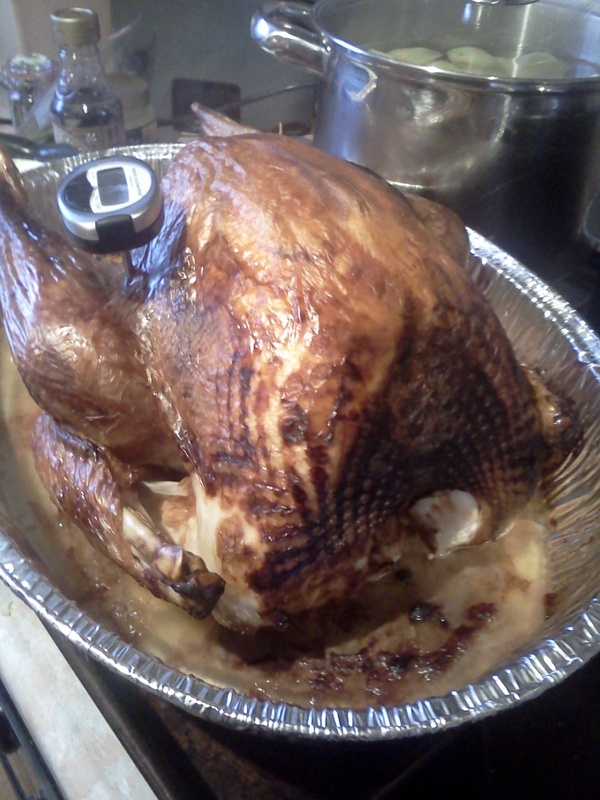 This entry was posted in food, orange, salt, turkey on December 31, 2012 by Gary. What’s that you say? You have leftovers from Christmas Day? Unheard of. 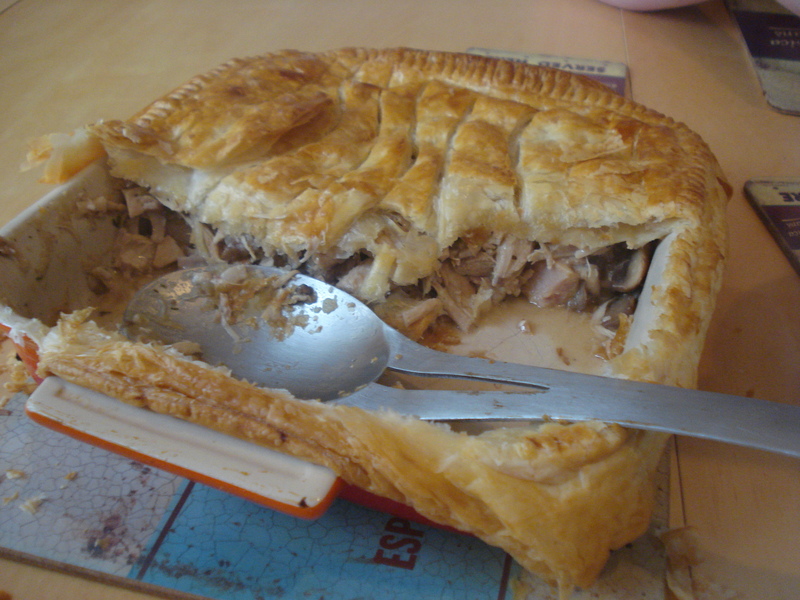 Previously I’ve made Jamie’s sweet leek pie with leftover poultry and it’s brill. Using that as an inspiration I made a mushroom version and it’s just as good. Heat a little oil in a large casserole dish, then add the onions, rosemary and mushrooms. Stir fry a little and cover with a lid to sweat for about ten minutes. Add the turkey leftovers, stock and creme fraiche and simmer for ten further minutes. Preheat the oven to 170°C. Pop a sieve over a saucepan and tip the turkey mix into the sieve. When the creamy gravy has all strained off transfer the mushroomy meat to a baking dish and cover with the pastry. Brush with the beaten egg and bake for 30 minutes or until golden. Serve with the creamy gravy that has been warmed through over the hob. 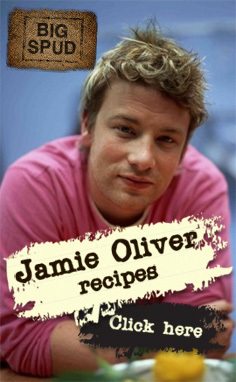 This entry was posted in food, mushroom, pie, stock, turkey and tagged jamie oliver on December 28, 2011 by Gary. 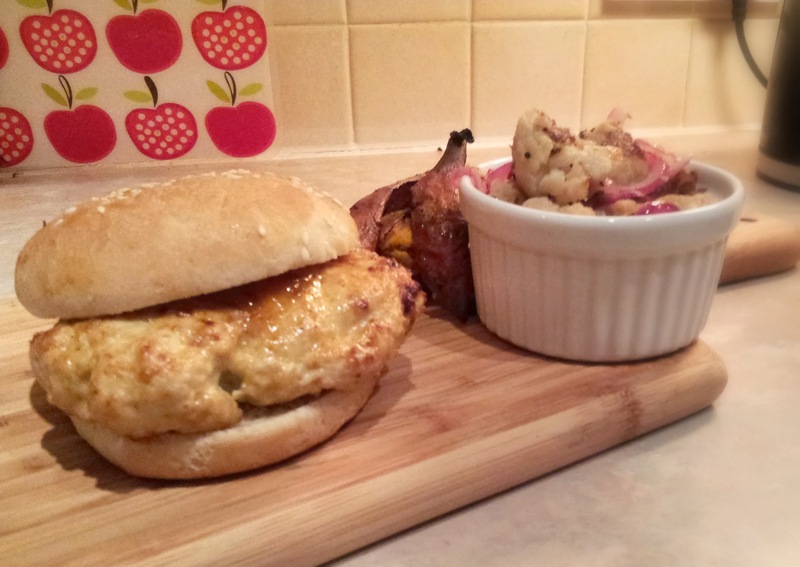 Sometimes, blog posts I write are to spread the news of some great recipe I found. Other times it’s about crazy experiments. But the aim has always been to be a log of what I cooked, and that’s what this Christmas Day feast is about: to remind myself what worked and what to fix for next time. Perhaps surprisingly I’d never cooked a whole turkey before: on previous years when hosting someone else provided the turkey on another occasion I went for chicken. So on your maiden voyage into turkey cooking, what technique do you follow to ensure no-one is disappointed (least of all me!) ? I was initially tempted by Matthew Fort’s method for slow-roasting the bird, especially given my previous success with long roasting times. But I just couldn’t take the risk and instead went for the technique of that doyenne of domesticity, Nigella. I grabbed a copy of Nigella Christmas from the library and swotted up. She favours a brining followed by a hot, quick roasting. I’m a big fan of brining poultry and with trusty meat thermometer in hand I had to follow this one. And I’m so glad I did. It was no bother to prepare as it is done a couple of days beforehand, and by using a foil roasting tray I could chuck it on the recycling pile and not have to scrub the pan after cooking. 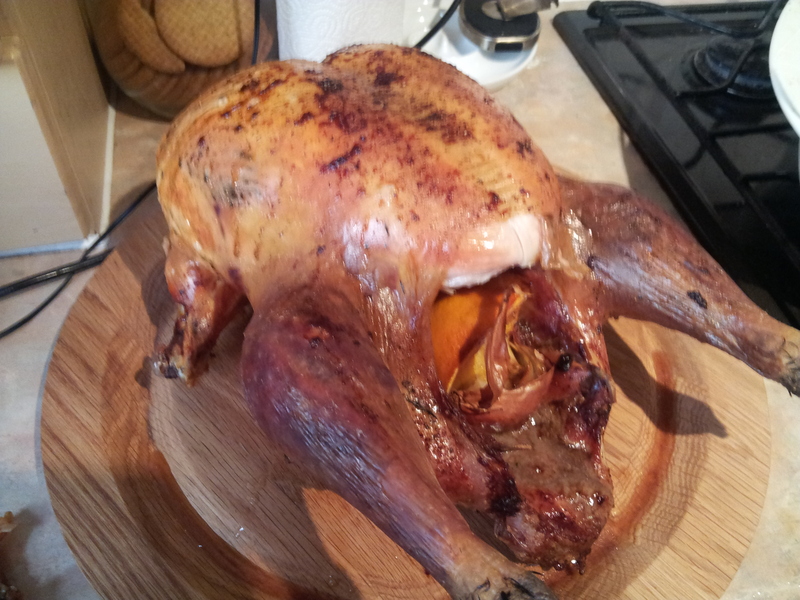 I had a 5.5kg bird and anticipated a cooking time of 2½ hrs and bang on then it was done. In fact I probably could have removed it 15 minutes earlier as the very outer skin was a little tough and the internal temperature was in the mid 80s, well within the safe range. That aside the flavour was lovely and texture great, so I was very pleased with bowing down to Queen Nigella’s recipe. So that was the main event. The roast potatoes, well you might recognise that recipe. Sprouts were also cooked to a previous tradition in my house, while carrots were simply steamed – there’s more than enough flavours going on to bother with tweaking these too much. There were also maple-roast parsnips, Jamie Oliver’s “get-ahead” gravy which I’ve made before and is absolutely terrific (a friend of mine commented that it “tastes of everything you put into it”), and on this occasion raised its game with turkey roasting juices and a quick turkey stock. Other people may raise an eyebrow at packet stuffing, but I grew up on the stuff and a roast poultry dinner just isn’t the same without it. Yes, I know it is little more than a packet of dust mixed with water making it no more sophisticated than a Pot Noodle but I love it. I can’t remember ever having bread sauce before but read this recipe on Recipe Rifle which, reading between the lines must be a Josceline Dimbleby recipe and therefore failsafe. However after hours of cooking it was watery. The flavour was gorgeous but unfortunately just too wet. I suspect I used rubbish bread which wasn’t in the mood to absorb liquid but I would definitely like to try it again. Bread sauce apart, all in all a success. Very pleased with the results. Merry Christmas! 3 days before: GRAVY – Preheat the oven to 180°C. Chuck the veg and herbs in a roasting dish and top with the chicken pieces. Roast for about an hour then transfer to a hob. Shake over the flour and stir all around until a thick paste forms, then pour over the water. Allow to bubble away for about 45 minutes and then sieve the solids off. The gravy can be frozen until needed. 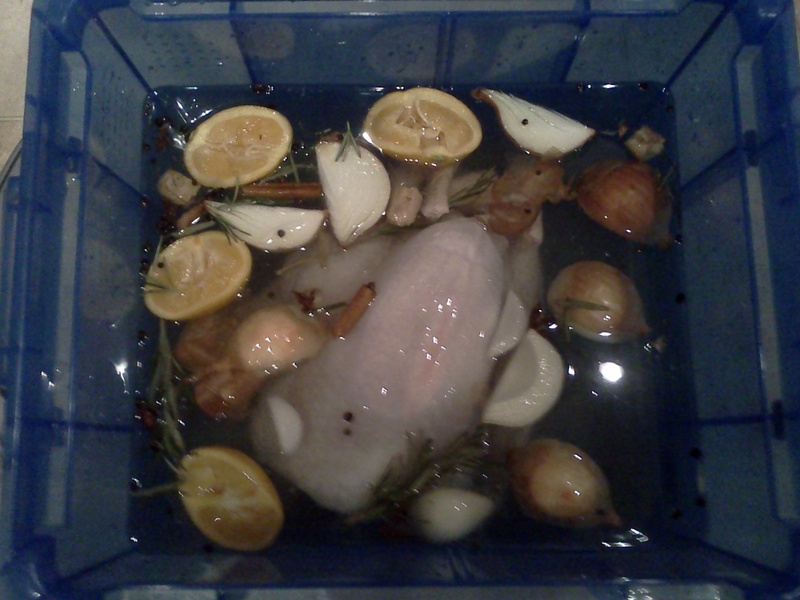 2 days before: TURKEY – chuck the turkey with all the brine ingredients in a large lidded container and top with water until the bird is covered. Leave in a cold place (I kept mine in the garage). 1 day before: BREAD SAUCE – Preheat the oven to 130°C. Combine all the ingredients in a baking dish, cover with foil and bake for 2 hours. Refrigerate until needed. 1 day before: YORKSHIRE PUDDINGS – Whisk the eggs and flour together with a pinch each of salt and pepper in a measuring jug and add enough milk to make a thin custardy-textured batter. Cover and refrigerate until needed. 1 day before: ROAST POTATOES – peel the potatoes but keep the peelings. I boil the peelings with the potatoes to impart super-earthy flavour, by putting them inside my cheapest (clean) dishcloth tied at the top. Cut the potatoes into golf ball-size chunks. Get a pan of water on to a rolling boil with a hefty hand of salt and boil the potatoes + skins for about 15 mins, or until they are super-tender. Drain and return to the hot pan (off the heat) to steam dry. When cool cover with clingfilm and refrigerate until needed. 9am that day: TURKEY – remove the turkey from the brine, drain and pat with kitchen paper. Leave on a rack over the sink to continually drip-dry and come up to room temperature. 9.30am: GRAVY – put the giblets, neck, any turkey trimmings you have into a pan with a quartered onion and barely cover with water. Leave on a low simmer for a couple of hours. 10am: CARROTS & SPROUTS – put the carrots into a steamer, with the sprouts on the top tier. Halve the sprouts if they are on the large side. You are bonkers if you put crosses into the bases. 10.30am: PARSNIPS – toss the parsnips in a little oil along with the maple syrup, plus a dash of red wine vinegar. Pop them in a roasting dish until needed. Preheat the oven to 200°C. 11am: TURKEY – stick it in the oven. I recommend a disposable roasting dish to avoid dishwash insanity. 1.15pm – 1.30pm: TURKEY – you should be checking this to see whether the bird is done around this time. When ready bring it out and cover with foil and a tea towel. When it comes out, stick the goose fat in a large roasting dish and put in the oven for a couple of minute to get sizzly hot. 1.40pm: POTATOES – put the potatoes into the hot fat. 1.45pm: STUFFING – mix the stuffing mix with boiling water and leave to sit. Put the parsnips in. 2.00pm: LOTS – dot the stuffing with butter and put in the oven. Cover the bases of a yorkie tin with a layer of oil and get in the oven to heat up. Get the gravy and bread sauce into saucepans warming up. Tip the turkey stock into the gravy too. Depending on how salty they are, you might want to add some of the juices from the turkey roasting tray. Bung the sausages in bacon into the oven too. Give the potatoes a quick toss and add the garlic, orange and rosemary. 2.05pm: YORKSHIRES – carefully pour the batter into the sizzling yorkie tin. 2.10pm: VEG – Pop the steamer on for 20 mins. 2.20pm: SPROUTS – get a frying pan over a medium heat and fry off the bacon. When coloured tip in the sprouts and chestnuts, seasoning liberally. After 5 mins take off the heat and add a drizzle of maple syrup. 2.25pm: TURKEY – carve (or better still, get someone else to do it). This entry was posted in brussels sprouts, carrots, food, gravy, parsnips, potatoes, turkey and tagged jamie oliver, josceline dimbleby, nigella lawson on December 25, 2011 by Gary. I’m a get-your-shopping-delivered kind-of-guy. In a family where both parents work someone carrying the shopping to your door just makes sense. It has it blips, when some things aren’t available, or maybe you can’t quite figure out what 350g of leeks look like so you over-order on purpose, but generally speaking there’s palpable relief when you shut the door on full cupboards without having left the house. At the moment Sainsbury’s are running a “5 meals for £20” in a planner format. No ready meals, all recipe-led stuff. Naturally it’s not incredible gourmet food but homely, economic grub. I’ve been trying them out this week including turkey & bean pasta. I substituted the chilli for paprika just for the hell of it. This should be as plain as you like but against expectation it’s jolly filling and jolly tasty. I froze some for another day, and will be looking forward to it. Get a frying pan on a high heat and add a splash of olive oil. Add the bacon and fry for a minute or two, until the bacon is coloured all over. Add the turkey and carrots and continue to stir fry for a couple more minutes until the turkey is browned. Add the puree, paprika and cumin and continue to fry for another minute, mixing well. Add the garlic, stock and tinned tomatoes. When it comes to the boil reduce to a simmer for ten minutes. Meanwhile, cook the pasta according to the pack instructions. When it’s done take a splash of the pasta water into the turkey stew then toss together with the drained pasta. Serve with garlic bread. 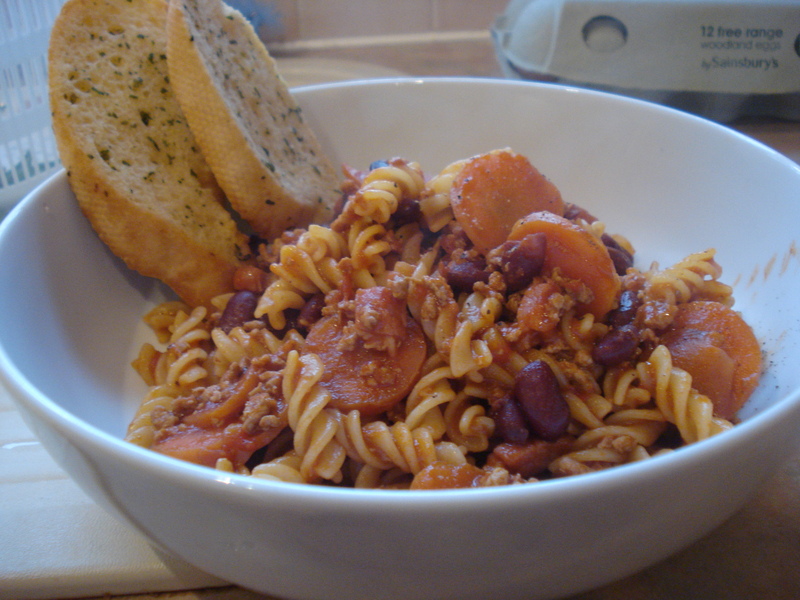 This entry was posted in bacon, beans, paprika, pasta, tomato, turkey on May 1, 2011 by Gary. I’m a sucker for any bolognese recipes. 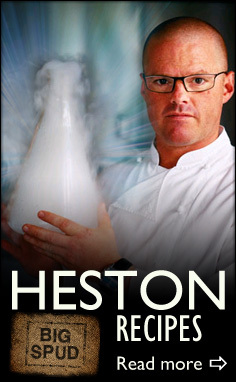 It’s lifted from my favourite cookbook of 2010, Leon 2 . The appeal of this one is in the turkey mince, both healthy and cheap. It’s never going to replace ‘proper’ bolognese but it’s dead easy, very tasty and freezes like a dream. Give it a try. In a large casserole pan, fry some onion in a little oil. When tender add the garlic and turkey and fry until browned. Add the mushrooms, fry for a minute then add the tomatoes, wine and stock. Pop the lid on and simmer gently for an hour and a half. When it’s ready, cook the spaghetti according to the packet instructions. Toss with the mince mix and grate over some fresh parmesan to serve. This entry was posted in mushroom, tomato, turkey, wine and tagged henry dimbleby on January 25, 2011 by Gary.